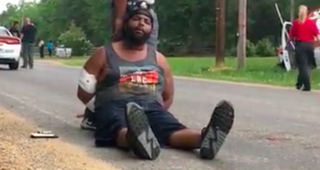 A 35-year-old man was arrested after he allegedly shot and killed eight people, including a police deputy who the suspect said “was just there,” on Saturday in rural Mississippi. Willie Cory Godbolt, 35, confessed on video to a reporter from the Jackson Clarion-Ledger, who was on the scene before the suspect was transported to jail. The paper reports that Godbolt went to an address in Bogue Chitto, Miss., to talk about his children. Someone called the police, and a responding deputy became one of the victims. Authorities say that Godbolt held a 16-year-old boy hostage at one point, but the teen was freed unharmed. Godbolt also said he wanted to die at the hands of police. Mississippi Bureau of Investigation spokesperson Warren Strain said the shootings occurred at three separate homes Saturday. Two of the homes are in Brookhaven, Miss., and one is in Bogue Chitto.